Cleaning the joints between the tiles, which becomes black and disgusting over time, is a real challenge. There are expensive steam devices to do this hard work, but not everyone affords those. And chemical products aren’t the best solution you can try to get rid of the dirt between the tiles. 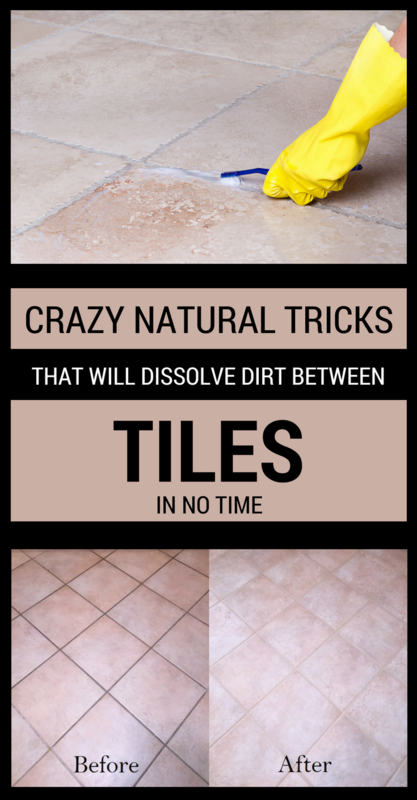 That’s why we propose some natural tricks that will remove dirt between the tiles just like magic. Spray hydrogen peroxide on joints and let it act for 10-15 minutes. Rub the joints with a toothbrush, and you will notice how dirt dissolves and easily removes. Moisten the joints with water, pour in baking soda and rub well. Or you can prepare a baking soda paste with hot water. Another option is to sprinkle baking soda over the tile joints, and then spray vinegar over them. The reaction between these two will form a foam A foam will be form that will clean in depth the dirt. Let this foam to act for 10-15 minutes, and then rinse. Mix lemon juice with salt until you get a paste. Apply the paste on the joints with a cloth or toothbrush, and then rub well. Leave to act for 10-15 minutes, and then rinse. This mixture is also effective for removing rust. Also, you can use only lemon juice, which is sprayed on the joints but also over the entire tile surface. After 10-15 minutes you can wipe with a damp cloth, and then rinse. Pour Coke directly on the joints and let it work for 10-15 minutes, and then rinse with warm water. Next How To Unshrink Clothes?